Description: The Tumbling Box Bar is an interesting sennit featuring reverse Half Hitches. Since you tie them in both directions, box-like designs are formed. Be sure to use two colors. 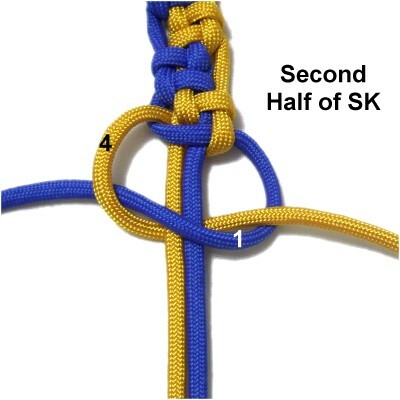 The loop at the top is made with a Slipknot, and there is a Square Knot, too. 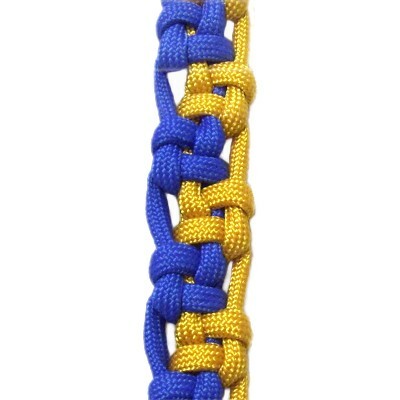 This design can be used to make Macrame bracelets, belts, leashes, straps, etc. 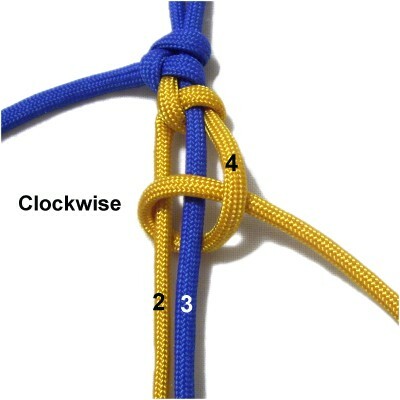 Paracord (550) was used in the example shown. 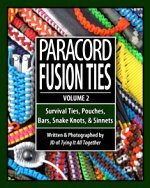 Be sure to read Cord Preparation to learn how to prepare the material if you decide to use it. 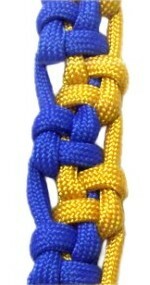 This knot design came from the Fusion Knots website. Click the image or link to visit. 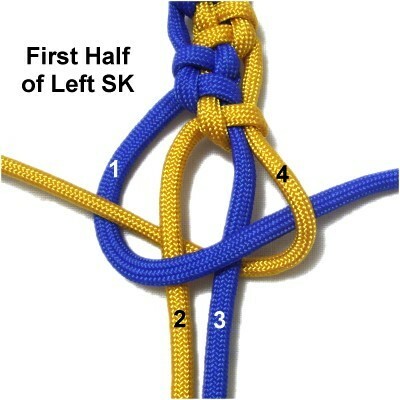 The video gallery contains many unique combination knots as well as historical knots. To practice, cut 1 cord of each color, at least 60 inches long. Prepare the tips to prevent unraveling, in the most suitable method for the material you are using. When using the Tumbling Box Bar in a project, the cords should be cut to 8 x the finished length you are planning to make. Cut both cords longer if you plan to make a button knot for a clasp. 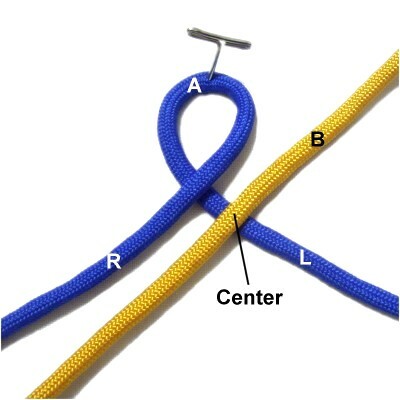 Step 1: Make a loop with Cord A, crossing right over left. 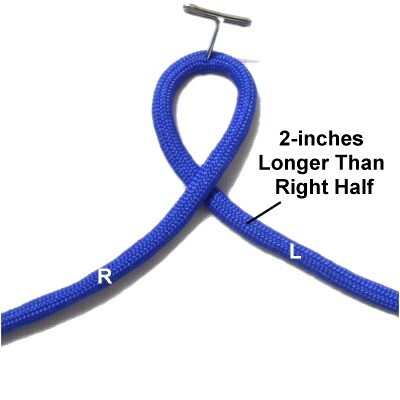 Arrange the loop so the left half is 2 inches longer than the right half. Place Cord B next to the loop, arranging it diagonally. 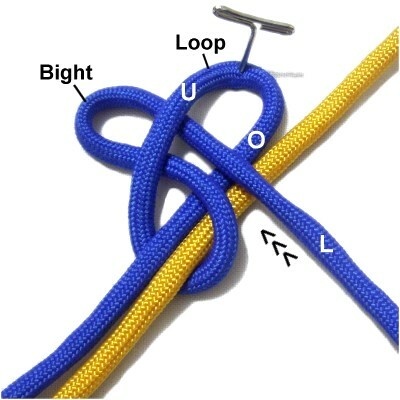 The center of it should rest close to the crossing point of the loop. To make a Slipknot, fold the left half of cord A to form a bight. Pass it through the loop over - under. Tighten the loop by pulling on the bight. Then pull the left half until the bight is 1/2-inch in size. Step 2: Make sure the two colors alternate as shown. Mentally number the cords 1 - 4. Bring the cord under - over cords 2 and 3, rotating counter-clockwise. As you pull it left, pass under cord 1. Designer's Tip: All the reverse Half Hitches in the Tumbling Box Bar are tied as described above (under - over - under). 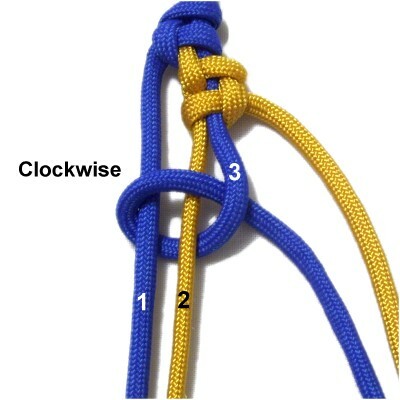 Some knots will be tied clockwise, and others counter-clockwise, depending on which cord you are using. 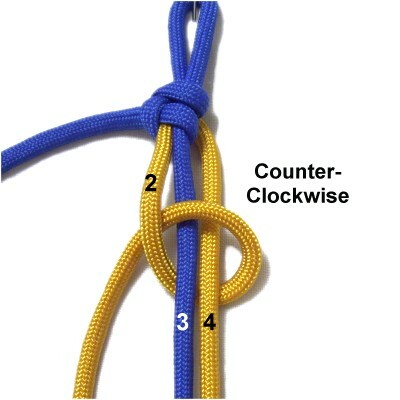 Step 3: Tie a counter-clockwise reverse Half Hitch with cord 2, around cords 3 and 4. Tighten it gradually, keeping cords 3 and 4 as straight as possible. 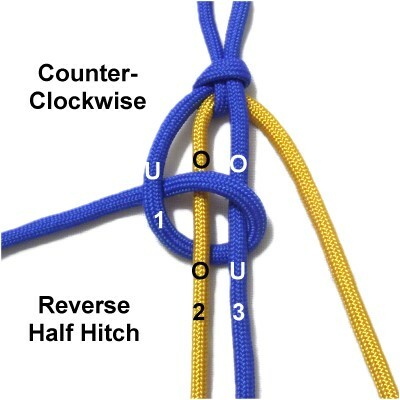 Make the next reverse Half Hitch with cord 4, rotating clockwise around cords 2 and 3. Tighten gradually, keeping cords 2 and 3 straight. Designer's Tip: When tightening, it's important to remove all the slack, especially when using slippery material like Paracord. Be careful not to tighten the Half Hitches too much. The goal is to end up with a box-like shape, as seen in the next image. 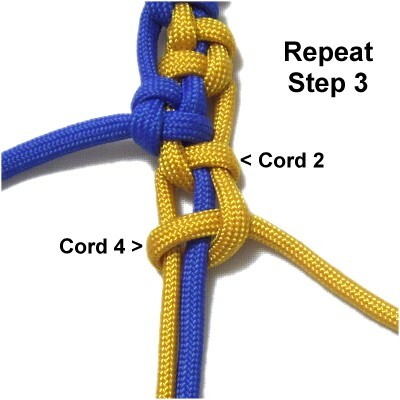 Step 4: Use cord 3 to tie a clockwise reverse Half Hitch around cords 1 and 2. Make sure cords 1 and 2 are straight while tightening. 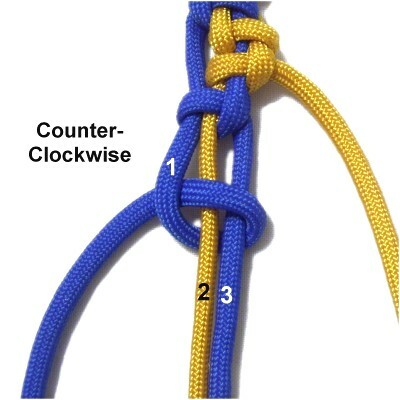 Use cord 1 to tie a counter-clockwise reverse Half Hitch around cords 2 and 3. Keep cords 2 and 3 straight while tightening. Step 5: Repeat step 3 to tie the next two Half Hitches for the Tumbling Box Bar. You use cords 2 and 4, which are the two halves of Cord B. Step 6: Repeat step 4 to make the next pair of reverse Half Hitches. You use cords 3 and 1, which are the two halves of Cord A. Step 7: Repeat steps 3 and 4 several times, until the sennit is the size you need. Make sure you stop on step 4. 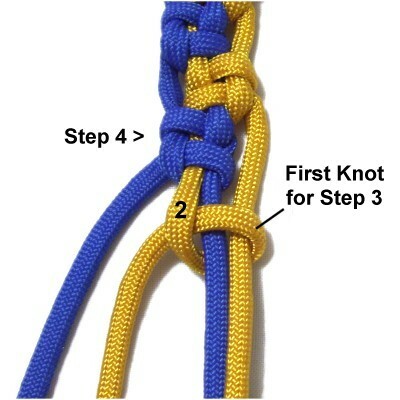 Then make the first knot for step 3, which is tied with cord 2. Move cord 1 over cords 2 - 3 and under cord 4, heading left to right. Move cord 4 under cords 2 - 3 and over cord 1, heading right to left. Move cord 1 over cords 2 - 3 and under cord 4, heading right to left. Move cord 4 under cords 2 - 3 and over cord 1, heading left to right. Step 9: Finish off the cords in the manner most appropriate for your project. 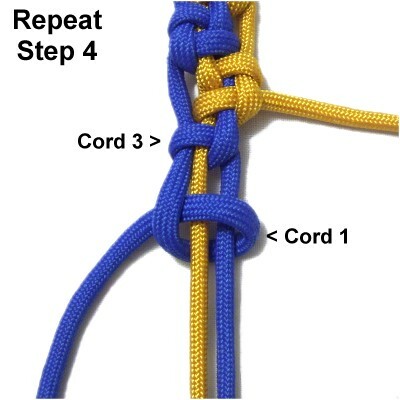 When using the Tumbling Box Bar for a bracelet, you finish off cords 1 and 4. Securing them to the back of the sennit works well. 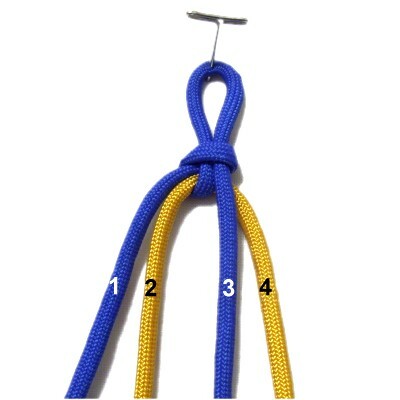 Cords 2 and 3 are used to make a button knot for the clasp. Have any comments about the Tumbling Box Bar? Contact Me.